Hezekiah loved his astronaut space party! My four-year-old son, Hezekiah, is a bit of a space nut (he plans on being the first man on Mars) so it was no surprise that he wanted a space party. While scanning the internet for ideas, I ran across the idea to have an Astronaut Training Camp. Hezekiah is just the right age to get into the theme. First up is an astronaut flight suit. After giving my son this, he spent over a year wearing it every chance he got! You can also add a cool space helmet, boots, and gloves. Because Hezekiah has seen Apollo 13, and we have read zillions of books about astronauts and space, he knew right away this was a flight suit. How to host an Astronaut Training Camp. We hosted this party eight years ago, but since then I have seen some amazing space parties like this one by Life Frosting. At our party we had five training stations set up for our little ones to go through. First was a thorough examine by a doctor (Hezekiah’s sister Adalia). The doctor weighed and measured each potential astronaut, tested their lung capacity (by having them blow bubbles), made them do jumping jacks and run a lap around the yard. Then we had a simulated “moon walk”. Each child drove the moon rover (Judah’s pedal car) over to the simulated moon surface, then had to “moon walk” around the cones. We took #10 cans and added ropes into it as handles. This was challenging for the kids and they loved it! Next came the hunt for “moon rocks”. I covered the little boys’ bedroom floor with balloons, sprinkled candy around, then covered the door with crepe paper. I put a tunnel in the doorway, and the children had to crawl through the tunnel, find three “moon rocks” then crawl back out. And of course, they had to learn to eat astronaut food. In this case, pudding in ziplock bags. We snipped off the end, and let them slurp away. This was one of the most popular activities. There is something about letting kids slurp sugary food and make a mess that is irresistible! The last activity was Splash down and Retrieval. The children had to toss paratroopers off the back deck, then go retrieve them and bring them back to safety. Then more gifts. I saw this idea for oxygen tanks on the internet and thought it would be perfect. Enoch wanted to make them for Hezekiah, so we worked on them together. 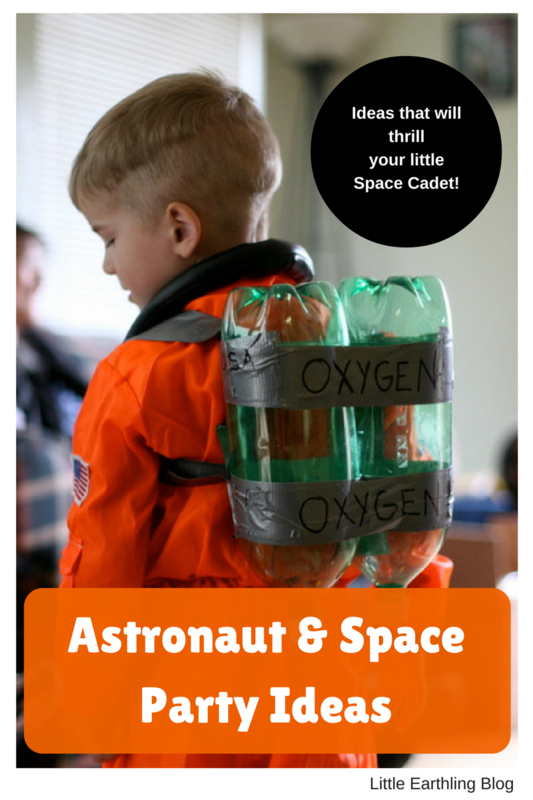 It was so cute, because when Adalia (as the doctor) asked Hezekiah if he was ready to be an astronaut he said, “Well, I don’t have any oxygen tanks”. So he was thrilled with these. Especially when we told him they had real oxygen in them! It was a great day, and so much fun to bring delight to our new four-year-old.